Long time clients hired us to completely renovate their 1700 SF loft with views toward the Hudson River on one of its three exposures. Originally a fur storage facility for the Astors, the building’s industrial high vaulted ceilings inspired how we approached the design. We created an open plan with dramatic backdrop for entertaining a few friends or large parties. Their wish list included a master bedroom with an ensuite lavish bath, a newly reconfigured chef’s kitchen integral to the living spaces, and a new guest bath. We tried to capture how light passes through the apartment throughout the day from sunrise in the east, to sunsets over the Hudson to the west by creating interior partitions of translucent custom blackened steel and laminated glass panels. The interior window between spaces welcome light as it passes throughout the day, celebrating the passage of time. The glass panels also give a wonderful sense of mystery. The existing vaulted ceiling’s orthogonal grid and new curved walls play off of each other and create the illusion of a much larger space. Gently curved walls lend spaces a sculptural sense of movement and drama. 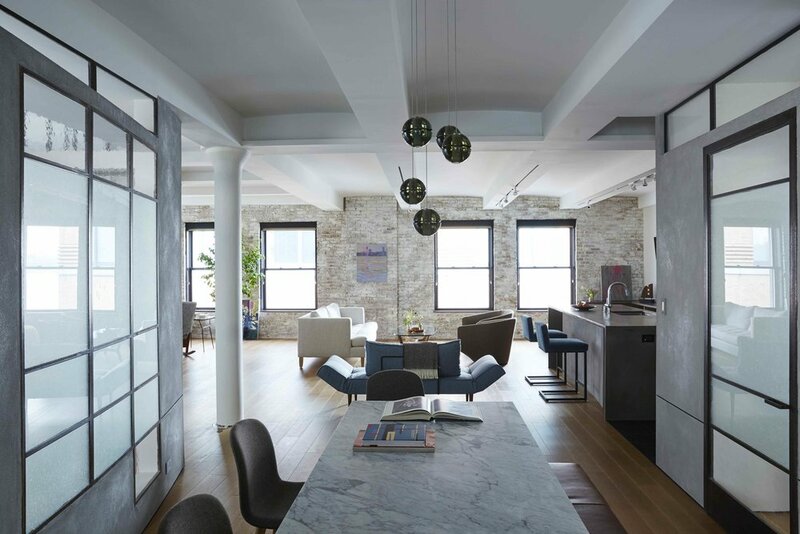 Artisanal plaster concrete wall surfaces allude to the west village’s industrial past.